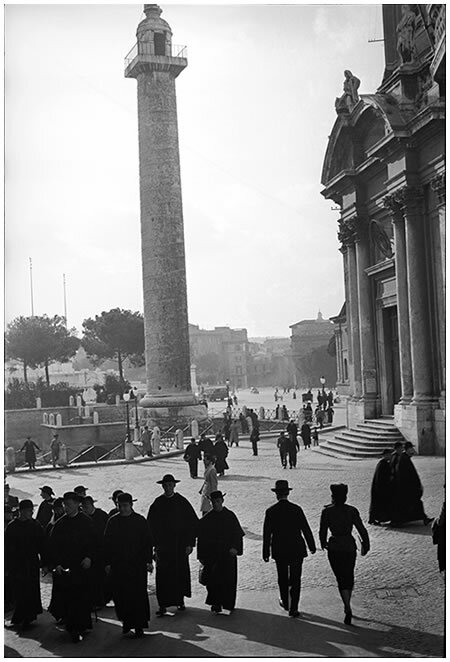 Passers-by stream towards Trajan's column in Rome on a late Sunday afternoon: shadows are long, the dark shadows of the year 1930. 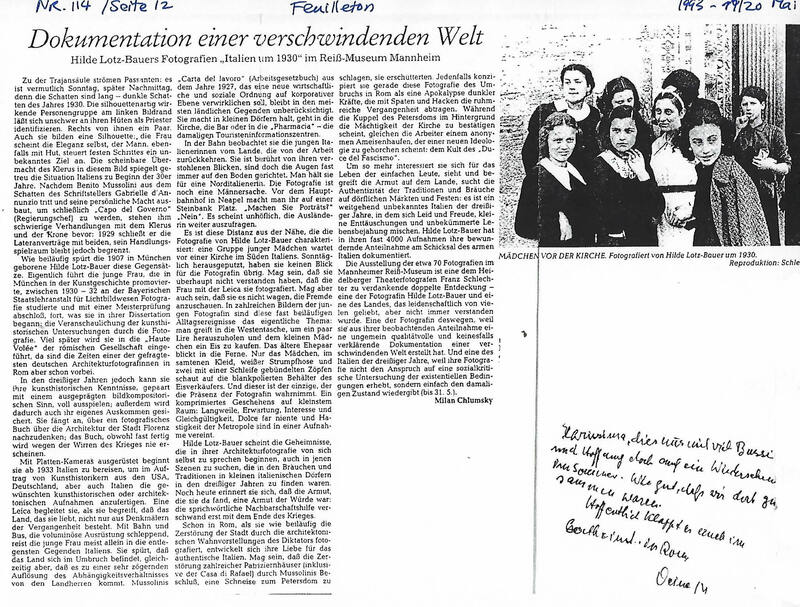 A group of people silhouetted on the left edge of the photograph can easily be recognised as priests by their hats. A couple walks on the right. They too form a silhouette: the woman is pure elegance, the man, also sporting a hat, strides purposefully to an unknown destination. The overwhelming power of the clergy in this picture is a faithful reflection of the situation in the Italy in the early 1930s. After Benito Mussolini stepped out of the shadow of the writer Gabriele D' Annunzio, building up his personal power base, finally to become "Capo del Governo", he still had to carry out difficult negotiations with the clergy and the Crown. In 1929, he signed the Lateran Agreement with both, but his space for manouevre remained restricted. As though by chance, Hilde Lotz-Bauer, born in Munich in 1907, perceives these contradictions. She took her degree in art history at Munich University, and then studied at the Bavarian State Institute for Photography, and received her masters degree in 1932. Her portrait of Italy in the early 1930s was a continuation of her academic dissertation: the illustration of art historical research through photography. Later she was to enter Roman social and cultural high-life but by that time her years as one of the most sought-after German architectural photographers were already over. During the 1930s, however, she made full use of her art historical training and a highly developed sense of pictorial composition. She also secured an independent income through her work. She began work on a major photographic record of Florentine architecture. Unfortunately, due to the untimely death of her co-author, the project remained uncompleted. Armed with a plate camera, she began to travel through Italy, commissioned by art historians from the USA, Germany and Italy, to record architecture and artefacts. However, she took her Leica camera as well, because she knew that her beloved Italy did not consist only of monuments to the past. By rail and bus, hauling her bulky equipment, the young woman travelled, usually by herself, to the most remote parts of Italy. She felt that the country was experiencing a major transformation. Mussolini's 1927 "Carta del Lavoro", had promised a new social and economic order on a corporative basis, but the power of rural landlords was hardly diminished. But II Duce's measures were ignored in most of the country areas. She stopped off in small villages, entered churches, the bar or the farmacia, which in those days served as tourist information centres. On the train, she observed young Italian women farmhands, returning from their work. She is touched by their stolen glances, as they avoid eye-contact, demurely looking at the ground. People think she is from northern Italy. Photography then was a man's work. In front of the Naples central railway station, someone makes room for her on a stone bench. "Do you take portrait pictures?" "No." It seems rude to ask the foreigner further questions. It is this contrast of distance and intimacy which characterises the photography of Hilde Lotz-Bauer. A group of young girls wait outside a church in southern Italy. Dressed up in their Sunday best, they are not interested in the photographer. Perhaps they did not even realise that the woman with the Leica was taking pictures of them. It may also be that they did not dare to look directly at the stranger. In many photographs these almost incidental, daily events become the real subject. A man reaches into his vest pocket for a few lire to buy an ice cream for a small girl. An old couple look into the distance. Only the little girl, in a velvet dress with white tights and braids tied with ribbons, looks at the highly polished container belonging to the ice cream seller. And he is the only one who seems aware of the photographer. An event compressed into the smallest space: boredom, anticipation, interest and indifference, dolce far niente and the hectic tempo of the metropolis are all brought into one photograph. Hilde Lotz-Bauer searches for the same secrets, which she uncovered in her architectural photography, in those scenes of customs and traditions to be found in the small Italian villages during the 1930s. She still remembers the poverty which she saw there, but a poverty with its own dignity: the proverbial neighbourly help only disappeared after the war. Her love for the authentic Italy grew in Rome, where she recorded, almost by accident, the destruction of the city due to the monstrous architectural fantasies of the dictator. Perhaps the demolition of countless palazzi, including the Casa de Rafael, decreed by Mussolini, shocked her. In any case, her photograph of this upheaval in Rome, has an apocalyptic quality, as dark forces remove past glory and honour with shovels and hoes. 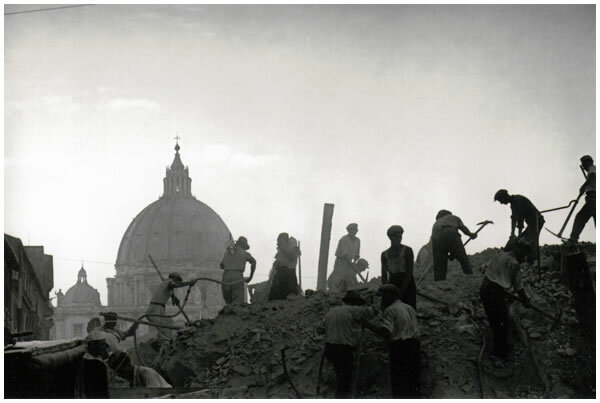 St Peter's dome in the background seems to confirm the power of the church, while workers labour on an anonymous ant-heap, obeying the commands of a new ideology: the cult of the "Duce del Fascismo". Her interest in the life of ordinary people grows, she sees and understands the poverty of the countryside, seeks out the authentic traditions and customs of the village markets and festivals: the country in her photographs was still unknown in the 1930s. Suffering and joy, small disappointments and a carefree affirmation of life are mingled together. Hilde Lotz-Bauer, documented her respect and admiration for the lives of the Italian poor in almost 4,000 photographs. These 70 prints at the Mannheim Reiss Museum only exist thanks to the work of a Heidelberg theatre photographer, Franz Schlechter. His was a double discovery: Hilde Lotz-Bauer and the country which is passionately loved by many but not always understood. Through her observant participation, the photographer has created work of an uncommonly high quality, which refuses to gloss over or glorify the reality of a disappearing world. Her work reveals 1930s Italy. It does not lay claim to social criticism, but simply shows the situation of those times.